At all those moments when scribes’ hands writing about a topic/event start shaking, then one must be aware and understand that it is surely a very frightful moment to reckon with. According to the warnings and signs given by Allah (SWT) and mentioned by the Holy Prophet (PBUH) about the Doomsday, a mildly reflective event was witnessed by the world two days ago, 15 March 2019, during Friday Congregational Prayers in Christchurch, the capital city of New Zealand. This short and mildly reflective glimpse of the Doomsday was demonstrated to the world by none but a Satanic White Supremacist when the faithful believers in One Allah – the Almighty were heads bent in prayers to the Almighty Allah during Friday Prayers. Surely this Satanic being who caused this massacre must have been the offspring of none but all those Muslim-haters of America, Israel, Bosnia, Yugoslavia, Bulgaria and India. I do not have to take help from any logic to prove my viewpoint. This 28 year old terrorist, Brenton Harrison, has himself described the details of his faith in his manifesto spread over 74 pages. He is an ardent follower of the headstrong, Muslims haters like Trump, Netanyahu, and Radovan Karadžić . He is furious at the ever-increasing number of immigrants. If looked at the various evil links of this Satanic person then one would surely find another name added to the list — the name of that very person who caused the death of two thousand innocent human beings in 2002. 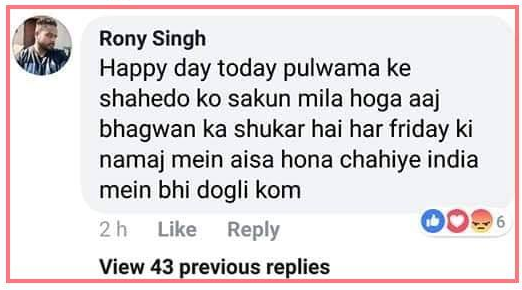 Facebook post of one Rony Singh working in Dubai. Translation: ‘Happy day today. The martyrs of Pulwama must have felt great relief. Thanks to god. This is what should happen every Friday. And after this very tragic massacre the evil-hearts in India, in their social media messages, described the martyrs of this tragedy as ‘the killed pigs’. These are the same lot who feel ill on the number of Muslims in the country. These are the people who follow our prime minister. However even after these hateful comments, neither the prime minister himself moved his lips; nor was any action taken against these hate mongers. During these two days this popular Prime Minister has spoken at three press briefings. And during these two days she wore black dress and head-scarf and in this attire she has met and spoken to the relatives and effectees of the massacre. Seeing her embracing and hugging Muslim women does not give any hint that she is a Prime Minister of a modern Christian country, giving the impression as if an effected Muslim woman hugging another Muslim effectee woman at the verge of bursting into tears and is only trying to control fearing letting it out of hand. In contrast here in India, the situation is that our ministers hug and embrace the murderers of Muslims and that the murderers of Muslims are elated to the rank of ministers themselves. This Satanic murderer was born not in New Zealand but in Australia. And In a news conference one of the hardline senators of Australia instead of condemning this Satanic murderer described his Muslim targets themselves responsible. At this outburst one seventeen year old Australian boy in anger hit the Senator with an egg on his head. This boy had been following the events through tweets. It is now known that the terrorist killer two years ago before this assault had travelled to Turkey, Bulgaria, and Croshia. And now this sojourn is also under investigation. All these three countries have been a part of Balkan countries that had played a pivotal role during the wars fought known as Ottoman Empire. The moral High ground of the Christian population of New Zealand is worth greatly admired. One pair from the adjoining suburb of Christ Church had on their Facebook appealed for the supply of Halal food for the victims and their families affected by the massacre. Within hours of this appeal so much Halal food got donated that the pair had to go back in their appeal to the donors with the request to stop their donations forthwith because food had gotten in excess. During this time a sum of million dollars also got collected. Meanwhile Christian ladies wearing shalwar, Kameez and scarf (dopatta) gathered around Idea Square to demonstrate unity with the martyred Muslims and their effected families. Meanwhile official security has been provided to all of the mosques throughout the country. And with that Christians have offered their Muslim neighbours companionship while going out of their houses. To dispel the fear of any assault the Christians are keeping company with their Muslim neighbours while going out of their homes. One 93 year old woman has sent an email to the effected Auckland mosque, wherein she has declared that she can hardly stand up on his frail legs due to old age but I am ready to stand guard every Friday with my stick in my hand at the entrance of the mosque. Upon seeing any assailant I can raise alarm. What is the most he can do before entering the mosque, that is try to kill me first. We are hurt and sad. Those who are callous and ill at heart and carry their daggers hidden under their sleeves and who carry the innocent blood stained on their hands, cannot understand the sorrow we have been subjected to by their inhuman deeds, but at least you can stop the hands that shower all the hateful venom over our wounds caused by them and at least learn a lesson from the great prime Minister of New Zealand and also borrow some of the courage from the New Zealand citizens whose religion is not Islam but who are collecting Halal food for their effected Muslim compatriots. You have lost to New Zealand. Now, be ready to lose to the millions of the right-minded God-fearing Indian citizens as well, because the wheel of time is not in your but in the all-powerful hand of the Almighty, the creator and sole-owner of this Universe. ← Is the Zionist Media Agency Snooping Around Islamic Centres?